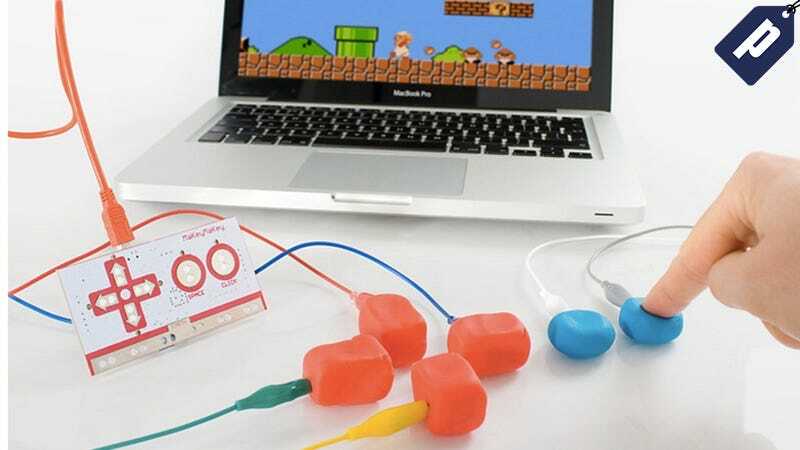 The Makey Makey Invention Kit is one of the top selling DIY electronics kits available, providing a fun and easy way to turn everyday objects into touch-pads and sensors. Right now, Kotaku readers can get the special collector’s edition for 20% off - just $47.99 with free shipping. Makey Makey is the perfect introduction to DIY electronics. You can create thousands of inventions, from a banana keyboard to a Play-Doh game controller, with no programming experience needed. Simply plug one of the alligator clips into anything that can conduct some electricity, and easily program it to control any input you’d like. There’s no programming, bread-boarding, or software required, and the special collector’s edition kit comes with all the clips, wires, and instructions you’ll need to get started - plus a special collector’s tin to store your creations. You’ll get all this plus shipping for just $47.99 - nearly 20% off retail value. Hit the link below to grab yours today.